Model T Ford Forum: OT times are changin. Model T Ford Forum: Forum 2018: OT times are changin. Sorry for the break in, Dallas. We had a break in at our cabin in the black hills several years ago. Our son went to the cabin and found the front door ajar. Someone broke the front door jam which wasn't very solid. I prefer he broke that rather than the glass sliding doors on the end or one of the windows. I see no way to burgler proof our cabin shy of half inch thick steel over all the windows and doors, including the walk out basement. The local sheriff thought it was kids but we disagree. A partial bottle of whiskey was taken, but not the bottle of rum. Peanut butter, a box of wooden matches, and a can of tuna he pried open with a knife and ate on the front steps, leaving the can. (there was a can opener in the kitchen). About 2 months later a body was found 4 miles away of a gentleman who had been missing around the time of the break in. This man flew to the Black Hills from the east coast, cut off contact with his family, and wasn't seen until his body was found. I assume he wanted matches for campfires, a little food, and a drink. Kids would have taken all the alcohol and trashed the place. Our cabin is 2 miles from the nearest paved road, and a mile down a 2-track. It's only visible to someone walking up the creek from the south. Due to being "off the grid" I cannot put alarms on it, only game cams to see who or what walked by it. We have no power to ourcabin either. The local sherrif said he would put our place on his check list. Once a month they will check on it. There are only three deputys and they go out of town 50 miles one way. They can only do so much. Just last year we put a chain across the drive to keep people out and from driving back the ridge on our property. Some long time friends have a country place in northeast Texas. After 100+ years of peace, it started to get broken into...multiple times. The jerks must've been looking for pain killers, because they were going through the meds, just like you're describing above. They were ruining the front door every time so the owner just started leaving the front door unlocked and a wooden sign on a chair by the door that said the door was unlocked and asked the thieves to please shut it when they were done robbing the place. Mr. Bryant, our friend, isn't sure if it's been effective or not because nothing's ever been taken (there isn't much to take anyway) and the door's always been shut when he's arrived. It's possible that someone was hungry and wanted shelter if this happened in cold weather. Or maybe they didn't find anything they could fence. If mostly antiques, they would be recognizable and would only be valuable to antique collectors. Sorry for your problem. Our family used to own a cabin too and it was along a very popular hiking trail. We had many breakins, but not much was stolen either. Only the inconvenience of replacing broken windows and doors. That sounds like more of a Bear getting in rather than a human. Bears can do an amazing amount of damage. I would not say times are changing! When Mom and Dad bought their farm in 1959 and were in the process of moving in, someone had camped in the barn, there was the remains of a campfire (dirt floor). I do not recall if they said if anything was missing, but they were trespassing non the less. Two-thirds of the guys at the Crucifixion were thieves. They have always been with us. My memory must be going. I thought I replied to this post. Guess Not! As a former Police Officer. I would say respect for law and order is not what it used to be. Many people refuse to take responsibility for their own actions seem's it is some one else's fault. they love to play the blame game. In the fifties if You got in trouble with the law most people thought it was Your fault. Now many say it's the Cop's fault. The speeder was doing 70 in a 35 with expired registration and no proof of insurance, But He wants the Officers badge number and calls IAD because He thinks He was singled out and unjustly stopped. Like Dorthy said in the Wizard of OZ I don't think We are in Kansas any more. Jim, what about having to purchase liability insurance so if someone tresspassed on your land and gets hurt you have to pay for it. Oh and you did post earlier today. One hour to be exact. I leave tomorrow morning on a 7 hour drive to make repairs to the cabin. Awful lot of effort for nothing. People are strange. One idiot (and idiot is a kind word for that mouth breather) broke into my house & stole stuff I can't replace, for what? They could get money mowing lawns but no, they'd rather steal things. Michigan and society as a whole, is changing at a rapid pace.....and not for the better. Dallas. A few ideas that come to mind. One thing that might help is Solar powered motion lights they are not expensive and are bright come on for a min or two when motion is detected. another thing I have done is install a NOS style game camera available on E-Bay with the old visible strobe flash I want them to know they are on camera.and Dallas thanks for the info on the prior post that disappeared.I don't know what You could plant that would grow quickly in Your climate to restore Your foliage cover quickly, I plated bamboo that after a number of years provides a thick green wall but it didn't grow fast some of the trash trees and shrubs grow the fastest.If Your cabin has cell phone service You can get a alarm system that reports back to you or a central station.some cell systems have internet service with a "Air Card" or You can put up a satellite dish that connect's to the web and put up real time web camera's You can monitor on Your phone. a few rubber snakes laying on the porch and a sack of skunk scent You hang up out side after you leave might help no body likes to be around them. Just a few ideas that might be helpful ? and it is the pits having to carry ins to protect the purps. Good Luck hope You have a safe and successful trip. Take an IR game cam with a good sensitivity setting and hang it about 20' up in a tree pointing at the front door. Get the ones that have the power saver setting. Some of them have an indicator light on the front when they take a pic. Make sure to cover that with a piece of camo tape or similar. Make sure to place the came where it can be concealed by branches and leaves/boughs. That worked to nab a crew of local thieves a while back ago. 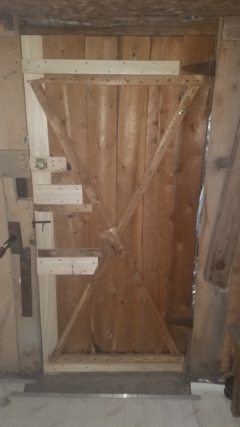 Well door repairs are done. Now I can spend some time with grand kids before going home tomorrow. 1 1/4 boards are not easy to break but they managed. A little extra re-enforcement for good measure. Dallas.Looks like You have a web connection at the cabin so You could install a web cam or even the door bell cam with camera & Mike built in calls You when someone is at the door. Door looks good. No power here. Probably could put a solar panel but they would just steal it. The 3 deputy's cover 900 sq miles so getting here in a timely manner is poor at best. Maybe it will be another 42 years before they do it again. I think someone that knows us may have done it because nothing was taken and they tried to nail the screen back on the rear screen door. They put the bar back down on the front door and put the wire back across the drive with the no trespassing sign on it. All my posting is from my cell phone. One issue is that insurance companies don't like to cover unoccupied houses. My policy states that the house cannot be unoccupied for more then 90 days. I would expect that there would be an extra premium for coverage for periods longer then 90 days. We have family that owns a cottage in NH. They employ a service that checks the place weekly - the inspection involves physically checking the doors and windows. If you could prove that you are utilizing that type of service, I would think the 90 day empty provision might go away. I'm going to bring this back up. As I was sitting in the doctors office waiting to get my new glasses fitted, I picked up a "Boys Life" magazine. I hadn't seen these for years. Anyway, in the "letters to the editor" section, there was a letter from a boy that read - "I'm wanting to make a little spending money and my parents said I should mow some yards. That doesn't sound very exciting. Can you help me change my parents mind?" I'm hoping this isn't indicative of the newest generation. But..........the times are sure changin'. To Follow up to what Don Conroe stated. I have some friends with a cabin way up north. Their very rustic remote cabin was getting broken into regularly. They finally stopped locking the door. Left a sign out side that asked if their visitors would sign in and close the door when they were done. They stated they would have about 6 "signatures" a year. Never a name, just something that stated they were there, and a date. Since doing such they have had to do no repairs. Sounds like it is time to plant some fast growing trees/scrubs just behind the power lines. IM a member of this club,our camp was in upper Vermont,near Barton, back from the road quite a bit,the first break in they took the gas lights 5 of them,loosend the gas lines??? behind the stove and fridge,didn't notice this till I hooked the new lights,the next time they kicked the unlocked door in tip the beds over spread a bag of flour over every thing.third time they smashed the window in the rear door and cut them self,took the copper pipes and the old lawn mower.the last straw was when we went up to do some fishing and found people living there,as I walked up to the cabin they were sitting on the porch,he asked can I help you?I cant repeat what took place next,we sold penny's from heaven.that was fifteen years ago still miss going there.